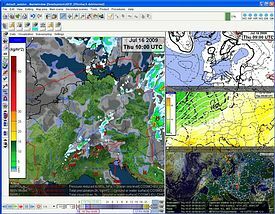 NinJo is a modern all-purpose forecaster workstation system for processing and displaying meteorological data, from the integration of raw data to its usage for forecasting purposes. 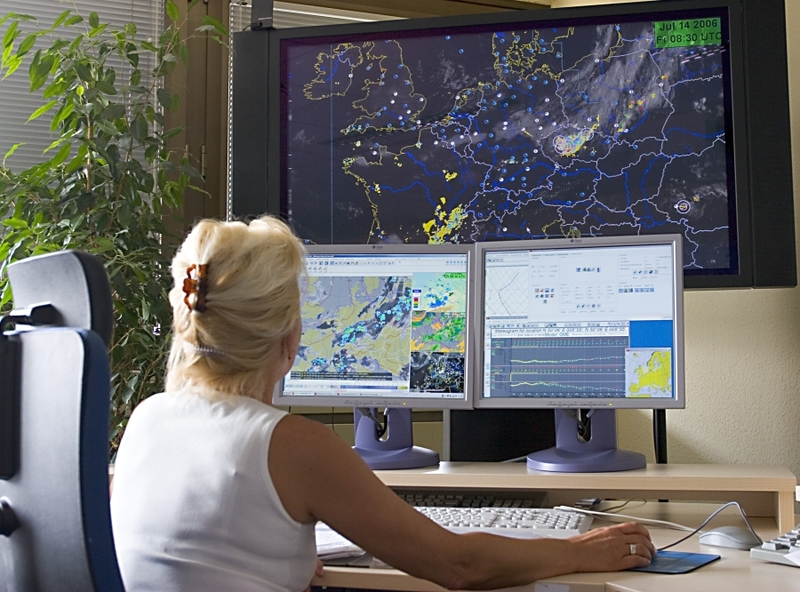 The multiwindow technology and specialised applications make NinJo the ideal tool not only for operational weather forecasting, but also for other applications where meteorological information plays a vital role for business. Meteorological data is displayed in layers which are combined into NinJo scenes. There are layers for visualising observational data, for example station measurements, radar echoes or vertical soundings. Other layers allow the visualisation of model data. Several layers taken together comprise the NinJo scenes. You have many possibilities to configure the layers and scenes according to your own requirements. For example, you can define the order, transparency and colours of the layers. The NinJo Main Window provides the framework for various areas of operation. It can contain up to four different scenes to visualise different data types. Besides the Main Window, secondary windows for specialised applications can be opened. Using these specialised applications, you can produce diagrams (e.g. tephigrams for radio soundings), various meteograms or cross sections. Furthermore, there is an application for the automatic monitoring of incoming data. NinJo also offers a sophisticated time control and animation tool to display the dynamic changes of meteorological features. Apart from the interactive generation of products in the NinJo Client, you can also generate products automatically with NinJo Batch. A typical NinJo Workstation on the forecaster's desktop uses two screens. On the wide screen in the background, the weather situation is presented in an animation to provide an overview for all forecasters in the office. Information about licensing and pricing can be requested using the Contact form.